Single site is $18 per night, this includes 1 vehicle. Extra vehicles are $18 each, per night. Double sites are $36 per night, this includes 2 vehicles. Extra vehicles are $18 each, per night. Triple sites are $54 per night, this includes 3 vehicles. Extra vehicles are $18 each, per night . Garbage cans are for Food Waste Only, Pack it in – Pack it out. This means that you must pack out all your garbage except food waste and toiletries. These items only can be deposited in the bear proof garbage bin located near the Host site. Be respectful of others. Keep noise and generators to a minimum at ALL times. Helmets must be worn when operating or as a passenger of a bicycle or ORV. Off road vehicles must be driven by a licensed operator and have insurance. 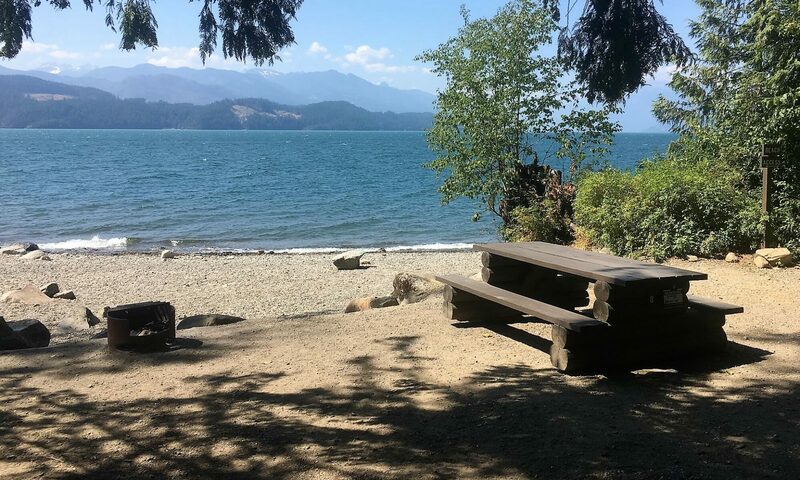 Consumption of alcohol is permitted within your designated campsite only and prohibited in all day use and common areas this includes the water front. Max campfire size is 19” x 19”. Do not damage or cut our trees. This is includes placing nails in trees and cutting or burning deadfall. You cannot burn painted wood, treated wood, plywood, pallets or wood with nails in it. Leave your giant rounds at home, you cannot split them and then the Host has to deal with it. Attend your campfire at all times. If you are not sitting beside your campfire, it must be cool to the touch. This includes when you go for a walk, go to bed and when you vacate your campsite. Do not discharge fireworks, firearms, bows, crossbows, bb guns, air-soft guns, pellet guns, sling shots or set traps. You cannot hold campsites. Erecting a tent or leaving a trailer unattended overnight is not permitted. You cannot go up and pay the Host for a site and then leave, once a camping permit is issued you must be at the site camping. If you remove your camping unit, the site is considered vacated and any remaining camping days will be void. All vehicles camping on site require a camping permit. Extra vehicles are $18 per night. No overnight parking without a current, paid camping permit this includes all parking lots. Violation of any of the above rules may result in a charge and/or order to vacate under the authority of the Forest and Range Practices Act. Long Weekends – 3 Night Minimum charge applies on all long weekends. There is no cellular service, no power, no potable water, no showers or flush toilets & no garbage removal service. Bear proof garbage bins for disposal of food waste are located near the Host site. Pit toilets are located throughout the campgrounds. A camper designated as a person with disabilities from the Ministry of Housing and Social Services with a current release of information form receive a 50% discount on camping fees for First Come First Served sites. Discounts do not apply on reservations. Seniors 65 years of age or older qualify for a 50% discount on camping fees for First Come First Served sites. Discounts do not apply on reservations. If you have a fire during a fire ban, you will be fined by the fire warden or police, evicted and be permanently banned from the campsite.